The 99 Percenters – Page 3 – Join the Revolution! Democratic presidential candidate Sen. Amy Klobuchar (D-Minn.) once ate a salad with her comb and ordered an aide to clean it after the staffer did not get her a fork. White supremacist Coast Guard lieutenant Christopher Hasson allegedly plotted mass terrorist attack. It began with Elizabeth Warren New Year’s Eve 2018 announcement that she would seek the nomination for president in 2020. That is 673 days before election day. Does that make sense? A presidential term last 4 years. Therefore candidates are running for the White House for almost 2 years. That’s insane. And it gets worse every election cycle. This means elected officials are spending all this time running for office usually outside of the state where they elected in. And the insanity is not limited to the time it times to run for the president. It has become normal for a candidate to raise $1 billion for their campaign. Equally insane. So should it be any wonder that we have the failed government that we do? We should demand a law that would prevent a presidential candidate to raise campaign money 6 months before the election. That would limit the campaign to that period of time. And while we are at it, let’s have public funding of campaigns. And in that way we take the corrupting influence of money out of elections. It would be a mistake for Bernie Sanders to run for president again in 2020. Like the last time the Democratic Party will make sure that he does not win the nomination. Additionally, he won’t be running against the most unpopular Democratic politician in American history. And by running a failed campaign he will be leading his supporters into a wild goose chase. Bernie should’ve have been leading a third party movement after 2016 rather than wasting his efforts transforming the Democratic Party. Sanders is an Independent, why not act accordingly. If he does decide to run then it should as a part of third party ticket. In the process Bernie will help build a movement. But he won’t do that. Sanders prefers a fanciful dream of becoming president rather doing the glamorous work of creating a true revolution in America. 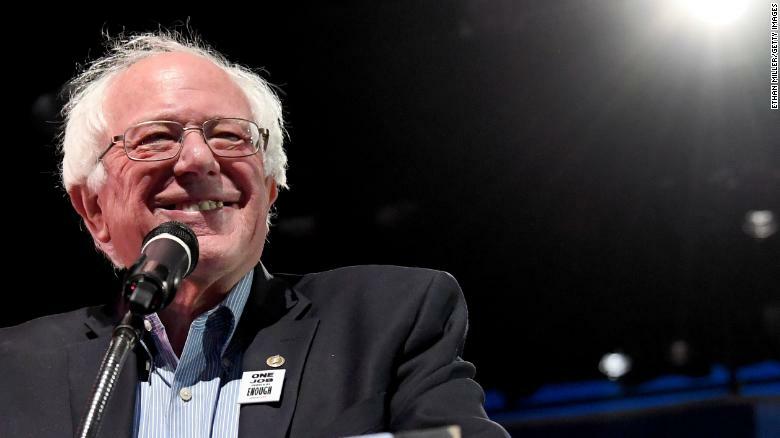 Sen. Bernie Sanders is widely considered a top contender for the Democratic Party nomination in 2020, but he doesn’t have the backing of what some politicians rely on as a close ally: his home state paper. “Bernie Sanders should not run for president. In fact, we beg him not to,” the editorial board of the Barre Montpelier Times Argus writes in a piece published Monday. The paper dings Sanders for missing “dozens of votes that likely would have helped Vermonters” during his 2016 primary run against eventual nominee Hillary Clinton. It hammers the Green Mountain State independent for favoring the national media circuit — Stephen Colbert’s late-night show, CNN hits and spots on MSNBC — over talking to local reporters. In documents submitted to the U.S. district court, the special counsel’s office detailed some of the evidence against Roger Stone, acknowledging for the first time they possess direct communications between Stone and Russian operatives known collectively as Guccifer 2.0, as well as WikiLeaks. The communications were gathered in connection to an indictment that Robert Mueller brought against 12 Russian intelligence operatives last year. Those individuals, who were all members of Russia’s Main Intelligence Directorate, or GRU, operated under aliases including DCLeaks and Guccifer 2.0. …In its initial indictment against Stone last month, the special counsel’s office revealed that a senior Trump campaign official “was directed” to reach out to Stone regarding WikiLeaks’ publication of John Podesta’s emails. Now that Stone himself was shown to have been in direct communication with Russian intelligence operatives, there is a direct line running between the Trump campaign and Russian military intelligence officials.